Even a cathedral as spectacular as Peterborough’s imposing 900 year old Norman building needs more than divine intervention to keep its 20 acres of grounds looking good. 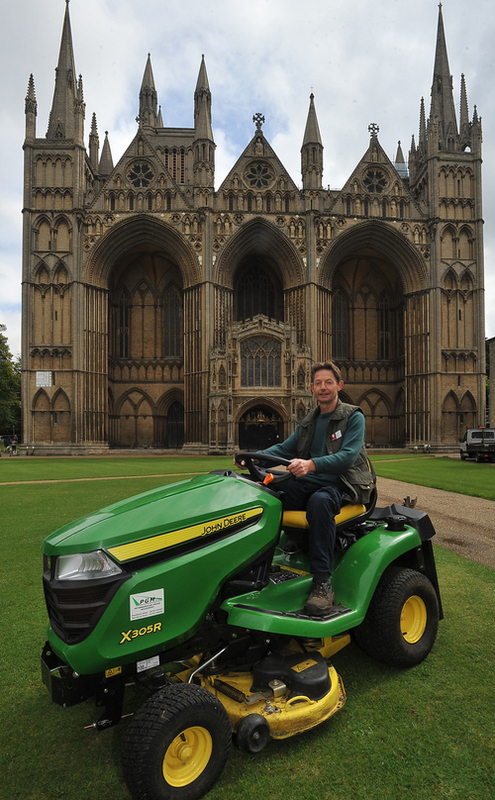 Head gardener and precincts manager Les Featherstone relies on his new X305R ride-on lawn tractor. “We had a John Deere LTR180 for 10 years and it was working every day, so another John Deere was the obvious choice when we decided to replace it. The new X305R is bigger but it’s so quick and easy to use. “There’s a large green at the front of the cathedral where people like to picnic and we encourage it. But it means that in spring and summer, when grass cutting is at its peak, we need to get in and cut the grass first thing before too many visitors are around. That’s when we really notice how much speedier the X305R is. Mowing takes less time and the rear grass box is so easy to empty too. “People think of Peterborough as a shopping centre, but view this area from the top of the cathedral tower and you see a vast array of green in the city centre that I’m responsible for,” Les adds.